Tactical Dynamics LLC manufactures and develops products that are built to withstand a lifetime of abuse, all products are therefore given a limited lifetime warranty. The warranty covers all products produced by Tactical Dynamics LLC unless otherwise specified in the item description. The major item covered in the lifetime warranty, FUNCTION. The product is intended to function in almost any circumstance and is designed so you can depend your life on it. However, you as a purchaser need to read the manual and learn how to correctly operate the device. Note on customer satisfaction, we would like all customers to be a 100% satisfied with our products. However fit may be an issue: Every magazine should fit their respective rifle unless otherwise specified in the product description. Some rifle manufactures have fluctuating tolerances that we cannot account therefore and those manufacturers are noted If there is a fit issue that cannot be rectified by the video tutorial or factory representative then the purchaser may get a refund or store credit, this must be done within 30 days of the initial purchase date. 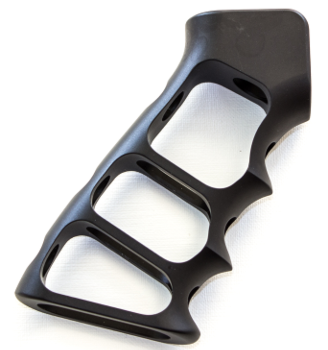 Skeletonized AR Grip Anodized Black. 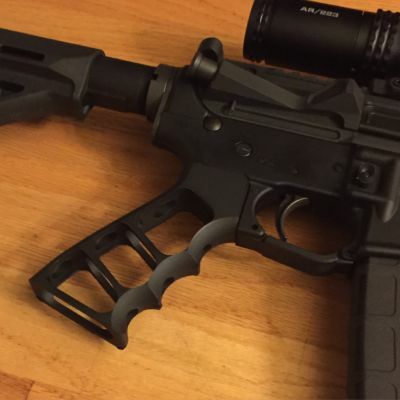 This unit will replace any standard AR15 style grip and give your rifle an awesome unique look with a durable and comfortable aluminum grip that has been hard coat anodized black to match your rifle.